Date completed: 31st July 2017. Weather conditions: Much the same semi-crap as the rest of the week. Some rain at the start (including one ten-minute period of thunderstorm which I spent sheltering under a tree), though after that it did clear up. Freezing cold though — the gloves I had been threatening to wear all week but felt it was July and I shouldn’t need them definitely came on today, and on the top of Blake Fell particularly, ferociously windy. 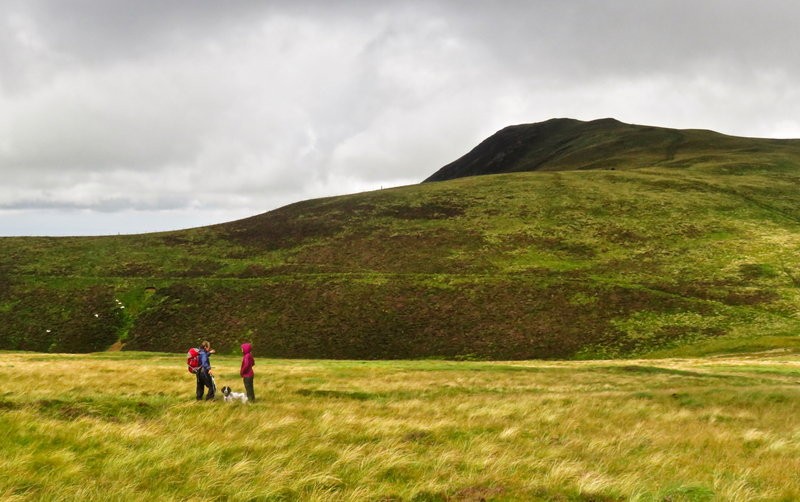 Summits bagged: Blake Fell (1878 feet above sea level, number 114 of my second round), Gavel Fell (1726’, no. 115). Both were previously bagged on walk 37 in June 2011. 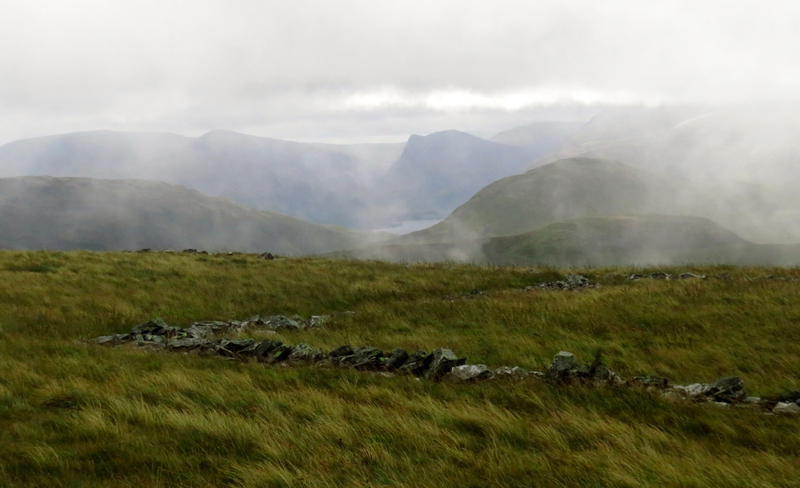 Today’s weather… The view is from Blake Fell, looking towards Buttermere, with Fleetwith Pike behind it. Start and end points: I started at the B & B we were staying in, in the village of Low Moresby near Whitehaven, but this is not going to be a convenient starting point for everyone: see the route notes below. Finished at the bus stop at Lanthwaite Green, where I caught a #77 bus back to Keswick. These run daily from Easter until the end of October each year. Distance walked: 15.2 miles approximately. See route notes below. Total ascent: 2900 feet (very) approximately. See route notes below. Pub at I-wish-it-was-the-end: The Kirkstile Inn, Loweswater, is an excellent pub, one of my very favourites in the Lake District. There is only one thing stopping it achieving perfection: which is that it’s not on the bus route. The nearest stop is Lanthwaite Green, which requires another half an hour of walking (and a couple of hundred feet of climbing) to reach. Route: From Felldyke onwards this is a good walk. Blake Fell might not be one of the District’s better-known summits but it’s a fine objective here as all the way up from Cogra Moss (which itself is an attractive sheet of water and worth visiting), Blake dominates the view — there is absolutely no doubt on this ascent where you are heading. 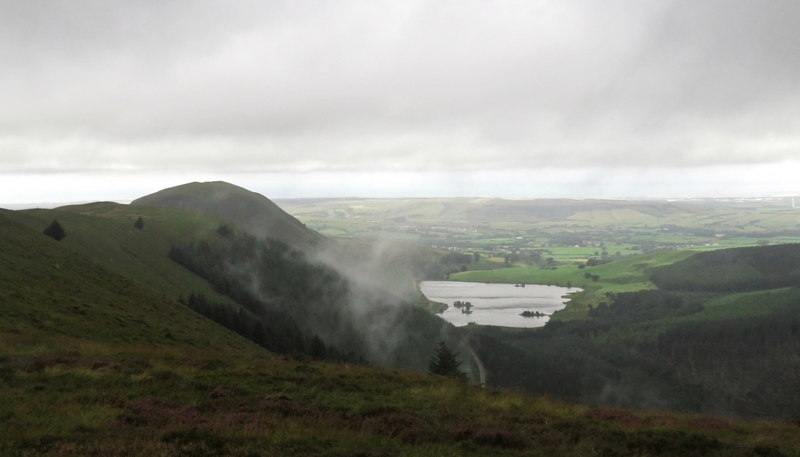 The Loweswater area as a whole is well worth a visit. The problem, however, is getting there in the first place. There is still a morning bus from Frizington to Lamplugh on Wednesdays and Friday mornings (departs Frizington 9.30am Weds., 9.35 Fri.) and this then returns from Cockermouth at lunchtime on Wednesdays and Workington on Fridays (see the Cumbria bus timetable website), making an afternoon walk just about practical. Other than these, Frizington itself probably makes the best starting point, as you can follow the national cycle route 71 all the way to Felldyke, which is (very approximately) about five miles, and would shorten my version of the walk by three or four miles. Frizington is served by regular buses from Whitehaven (though not on Sundays or public holidays). Starting from our B & B (which was a very pleasant place to stay by the way — their website is here) seemed practical on looking at the map but it ended up a lot further than I had anticipated, as the layout of roads makes a beeline impossible and so there’s a lot of wandering around. 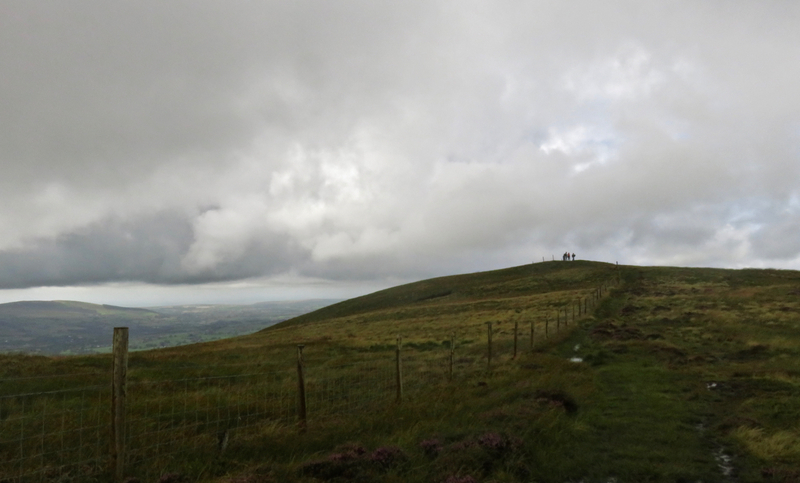 I estimated two hours from there to Felldyke, but instead it took over three, and it was exactly four hours and ten miles from Low Moresby to the summit of Blake Fell, making for a very long and rather dull prologue. I did at first think that starting at Parton station on the coast would be practical, but this would add another 1.5 miles and about another 400 feet of climbing to what is already a long walk, so in fact I am not going to recommend this. Start at Frizington. Bearing all that in mind it seems pointless to go into too much detail about my route from Low Moresby to Felldyke — though see also the commentary below where you can read all about the worst footpath in Cumbria. 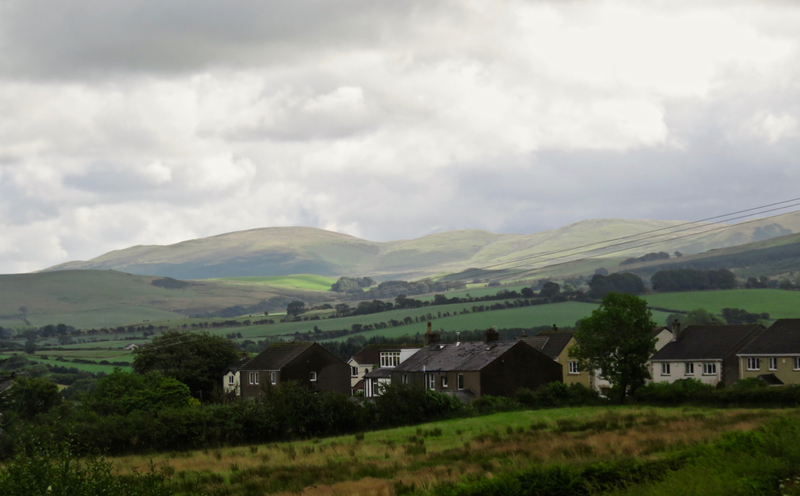 Essentially I followed the road round via Pica and Asby, coming at Felldyke from the north. There is a small car park here that marks the start of the ascent proper. From here follow the path up to Cogra Moss, which is very obvious. As I said above this is an attractive tarn, no less so for being artificial: as its name suggests, it was once a marsh until the outflow was dammed to provide water for Lamplugh below and other nearby villages. At the end of the lake, look for and take the path rising steeply on the right, known as ‘Donkey Trod’. Those who lack a head for heights may not enjoy this path as there is a steep drop on one side. At the top of this path, don’t follow the forest road. Instead, take the path going straight on; it seems to be heading in the wrong direction at first, but it will soon correct that by swinging round and following the fence upwards (there is no need to go through the gate here). 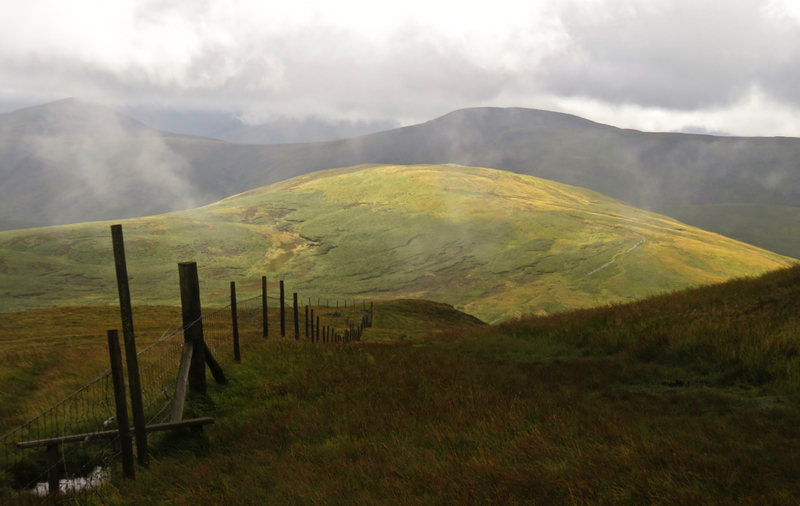 You can follow this, the fence all the way up to the summit of Blake Fell, curving around the Cogra Moss valley. For Gavel Fell, retrace your steps from Blake’s summit down to the last stile you passed, and cross it, to then follow a ‘branch’ fence up in turn to Gavel Fell’s summit. It is probably better to be on the right-hand side of the fence as it turns up for the climb, but there are plenty of places to cross. From Gavel Fell I had originally thought of going on to Hen Comb, but in the end that would definitely have been a fell too far. 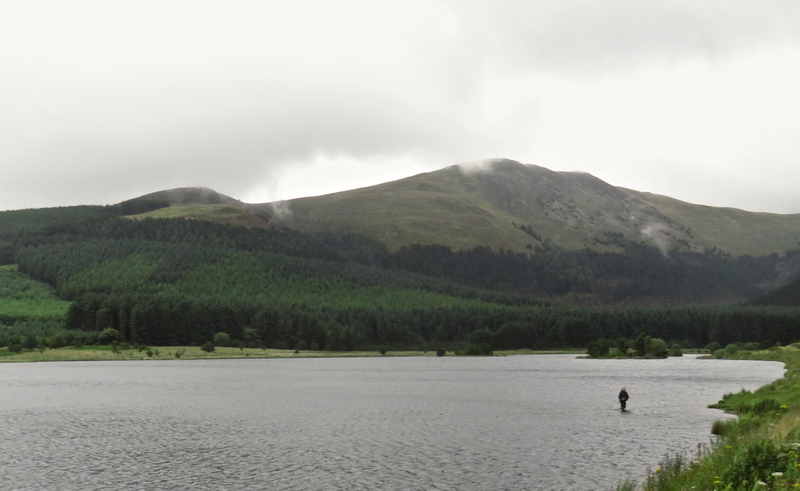 So I descended to Loweswater by the same route as ended walk 37. The descending path heads off at an angle from the stile in the corner of the fence nearest the summit. It’s a bit boggy in parts but otherwise leads uneventfully down through ground carpeted in heather and bilberry plants. At the broad ‘drove road’, turn left, this drops you down to Highnook Farm and eventually to a car park. Follow the access road, turn right, and then right again, to reach the Kirkstile Inn. 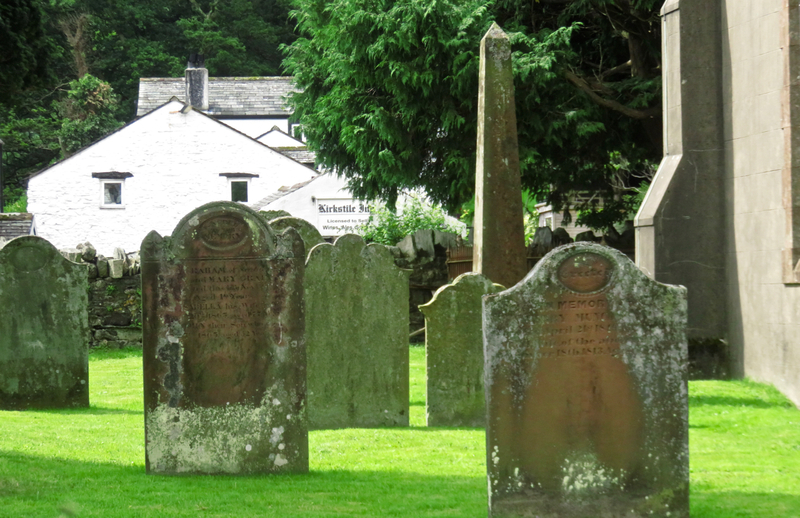 As noted, however, this is not the end of the walk as you still need to get to Lanthwaite Green. To get there from the Kirkstile Inn, take the lane to the right of the church back onto the main road and follow this for a half-mile or so to the car park at Scale Hill. Follow the broad path through the trees and take the second (not the first) path on the left for Lanthwaite Green. At the main road, turn right and the car park just down there is where the buses stop. Waiting for the bus at Lanthwaite Green. 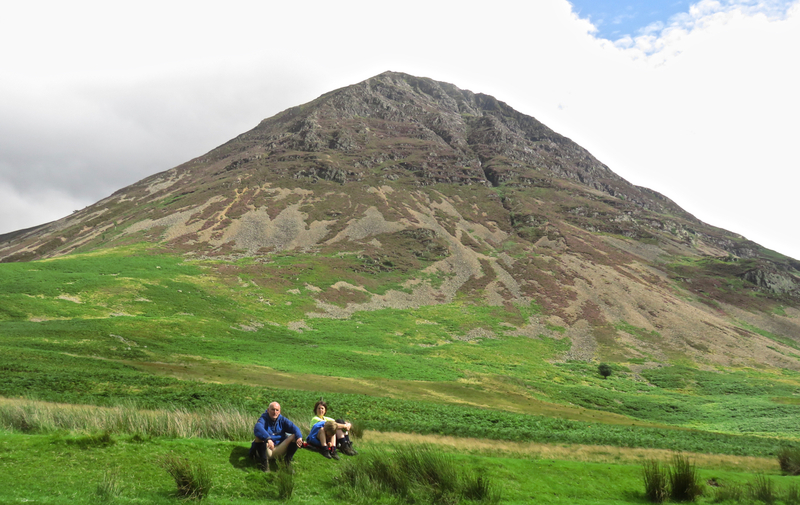 Grasmoor behind. 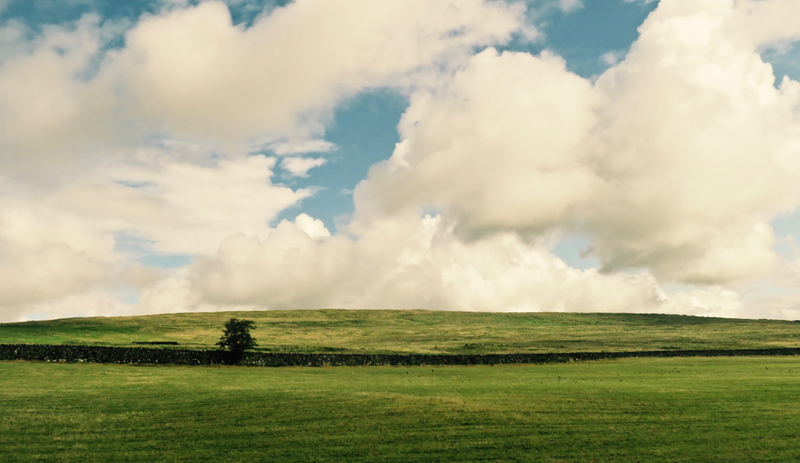 End of the holiday commentary: And so I come to the end of this week in the Lake District. My final tally is ten fells on four walks, total distance walked about 45.5 miles and about 12,000 feet climbed — so these ten fells have each been hard earned! It is a mild shame the weather wasn’t better; although being fair about it, I never got a soaking, and at least the latter half of the week offered up summit views. But it was cold, and windy, weather that might be expected in March, say, but hardly the kind of summer one expects in late July. Then again, it was July 29th 2012 that saw the single worst day of walking weather in my whole eight years thus far (walk 60b) so maybe I should be thankful that it wasn’t worse. 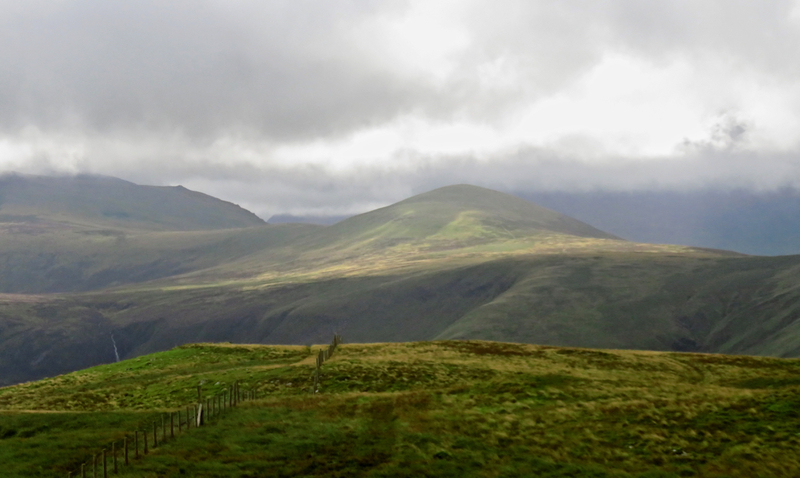 Would have been nice to have one sunny day out on the fells though. Making a deliberate point of going for some hard-to-reach fells, thus exploiting the fact that I was staying in the area and not travelling in from Yorkshire, was the right thing to do but that also added to the energy requirements of the week. Like Friday (walk 133), it took hours today to reach even the first summit, and I cut the anticipated last one (here, Hen Comb) out: one reason I have been fortunate so far to avoid either an accident caused by fatigue or from rushing to make a bus — and to avoid having to get home in the middle of the night, via Manchester or somewhere similar — is that I know when to call ‘a fell too far’, and that definitely would have been today. It had been quite a long enough walk already, thank you. I must also note the disgusting state of a couple of the paths I tried to use on my way in this morning. Should you be in the area, do not, under any circumstances, think that the path from Fairfield farm (NY017215) to Startoes is going to be a useful short-cut. This reaches a junction in the farm road where a stile leads into a wood that might have offered a passable route twenty years ago but not any more. And even after battling through that to another stile out of the thicket, you are then deposited in the most revolting quagmire of a field from which there is no escape. Even then the path ends at Startoes anyway from where there is no further route up to the road except by almost doubling-back. OK, hindsight tells me not to use that path again, but that’s not the point. A right of way should mean more than just some legal nicety. A right one cannot assert in practice is no right at all (the down-and-out has the right to eat at the Ritz, but will never be permitted to do so for various reasons, so the right is meaningless). This was not even the only bad path of the day: the path marked on the map as running east from Whinnah farm (NY076205) is signposted as a ‘Public Bridleway’ at both ends, but to think that a horse might get down it these days is ludicrous, and people can only do so by barging through vegetation that has almost completely swamped this narrow alley between two luxurious and prickly hedges. We have a garden at home and it borders onto a public footpath: and we have a duty to maintain our hedge sufficiently so this right-of-way is maintained. Rights imply duties; the duty here is that of the landowner and/or the local council. In too many cases these duties are being totally neglected. Anyway, I did make it up Blake and Gavel Fells in the end, but that’s only another small chip in the Western Fells, with which I still lag behind somewhat: I have by now done a third of all the other Wainwright volumes on my second round, but with volume 7, only a quarter. Time to return home, though I’ll be back within a couple of weeks, hoping for better weather….